Black Friday may still be a few days away, but the deals are already rolling in and if you're looking for some new headphones, we've got good news. These high-quality Bose QuietComfort 25 headphones already have over 50% off in the Amazon Black Friday sales and with expert noise cancelling capabilities and good sound quality, they're some of the best around. Plus, with 55% off they've suddenly become very affordable for an oh-so appealing £129.94. They're perfect for both hooking up to an iPhone (and there are Android versions available too), or using in conjunction with a games console or smart TV to either experience games in crystal clear sound, or enhance that latest TV show you're binging on Netflix. Bose is a big name in sound design, and its headphones are considered the best in the business... so how do the QuietComfort 25 models stack up against the competition? This Black Friday deal might good (ok, it's great! ), but you still want to know you're getting the right headphones for you. The Amazon Black Friday deal sees a whopping 55% knocked off the Bose QuietComfort 25 Acoustic Noise Cancelling Headphones for Apple devices. Originally £289.95, you can now pick up these impressive headphones up for just £129.94, but that's still a fair bit of money (despite the huge saving), so are they worth it? Should you buy the Bose QuietComfort 25 headphones? Here’s our guide to the pros and cons of the headphones, and whether or not the deal is good value for money. Let's start with the most important feature of the Bose QuietComfort 25 headphones - the noise cancelling. These headphones will make background noise a thing of the past as, like most Bose headphones, the noise cancelling aspect is superb. No more having to listen to other people's conversations on the tube. No more background office chat. No more traffic noise interpreting your movie marathon. With the Bose QuietComfort 25 headphones all that disappears and you're left with an incredible sound experience. You turn the noise cancelling feature on and off using the switch on the right cup, but you do need to remember to turn it off once you're done as there's no auto-off function. Leaving the noise cancelling function on will drain the battery, but it won't necersarily kill them dead unless you leave them on for a LONG time. Another thing to note is that the Bose QuietComfort 25 headphones are better at cancelling out low-frequency sounds, which means you can listen to your music on low while still having any background noise cancelled out. However, it's not as good cancelling out higher-frequency noise, although this can be helpful if you need to listen out for announcements on public transport. Noise cancelling is all well and good, but what about the sound quality of the Bose QuietComfort 25 headphones? You'll find the soundstage both wide and well defined, with a powerful bass and good treble clarity too. Having said that, they don't offer the best sound quality of other headphones within its original price point. The focus of these headphones is really the noise cancelling and the sound quality does suffer a bit for it, but it's still good. You just need to decide which is more important for your needs - noise cancelling or sound quality. When it comes to headphone design, we all want something which looks good, but the most important thing is the fit. After all, you might be wearing these headphones for hours on end on a flight and there's nothing worse than aching ears to add to the other uncomfortable aspects of flying. Happily, the Bose QuietComfort 25 headphones squidgy pads and low weight make them ideal for wearing for long periods of time. The flat design of the headband makes for a good fit too - especially if you're a runner or like to listen to music in the gym - and the inner padding is both comfortable and hard-wearing. Finally, the cable which comes with the headphones has a three-button remote, and there are versions for both iPhones and Android handsets. Bose QuietComfort 25 headphones - Should you buy it? 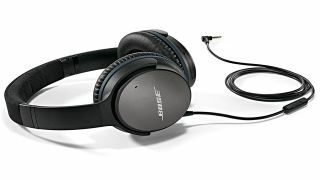 The Bose QuietComfort 25 headphones are a great pair of headphones full stop. While there are other, better sound quality headphones available for its original price, you'll struggle to find anything that beats them while it's available at this significantly reduced Amazon Black Friday price. If what you're looking for is a really good pair of noise cancelling headphones, which you can use on the go, at home, and all day long with all your Apple devices, you won't get better than the Bose QuietComfort 25 headphones for your money.